Online mattress companies are more prevalent than ever. Not only do online mattress brands produce quality products, they eliminate the hassle of in-store buying. Plus, they are delivered straight to your door and often come with generous sleep trials. If you decide you don’t like the mattress you bought online, you can usually return it for a full refund. Even though buying online has made mattress shopping easier, it is still a difficult task to tackle. We took the legwork out of your search by researching a variety of brands and compiling this guide to help make your choice easier. There are so many online mattress brands from which to choose. But Amerisleep’s AS3 is our favorite option of all. Amerisleep’s AS3 uses eco-friendly memory foam and clinically-proven technology to promote a better night’s sleep. Keep reading to learn about the online mattress industry and why we consider the Amerisleep AS3 to have the highest value. Online mattress companies offer a fresh take on the entire mattress shopping experience. Eliminating the need to go to a crowded store with salesmen trying to push their latest model on you. Some purchases are best to make in person, but your next mattress doesn’t have to be one of them. One of the key perks of shopping online for your next mattress is delivery. Almost all online mattress companies offer free shipping and delivery. Because online mattress companies ship directly to the buyer, they can out the middleman. Also, for online mattress companies whose beds are made to order, they can cut their costs further. Therefore, they can sell their beds for less than a mattress store. You also get a more direct experience, with less hassle. Buying your mattress through an online retailer is an easy and affordable solution to finding your next new mattress. One of the best things about buying a mattress online is most online mattress companies offer free trial periods. An adequate trial period is at least 90 days long. You pay for the mattress up front and once delivered, your trial period starts. Some companies require you keep it for a certain amount of time before returning it (30 days seems to be the standard), while others allow a return at any time within the sleep trial. If you decide to keep your mattress, then you are set! However, you are not stuck with the mattress if you realize it’s not right for you within the allotted time frame. If the mattress does not meet your sleep preferences and needs, you can return it. More often than not, the return is entirely free, and you get a full refund. Once you go through this process, you are then able to try a new mattress. You can, theoretically, do this until you find your perfect mattress. Hopefully, you do not have to do this many times. Doing just a little bit of research and asking the right questions can increase the chances of finding the right mattress on the first try. Read ahead to discover what mattress we think you won’t return. Please note: everything above is a broad summary of the online mattress industry. Not every company is going to have the same policies. Therefore, not every company is going to offer the same quality, returns, shipping, warranty, and trial period guarantees. Make sure you understand the details of each mattress before making a purchase. After looking at the mattresses currently available online, there is one that stands out significantly: the Amerisleep AS3. 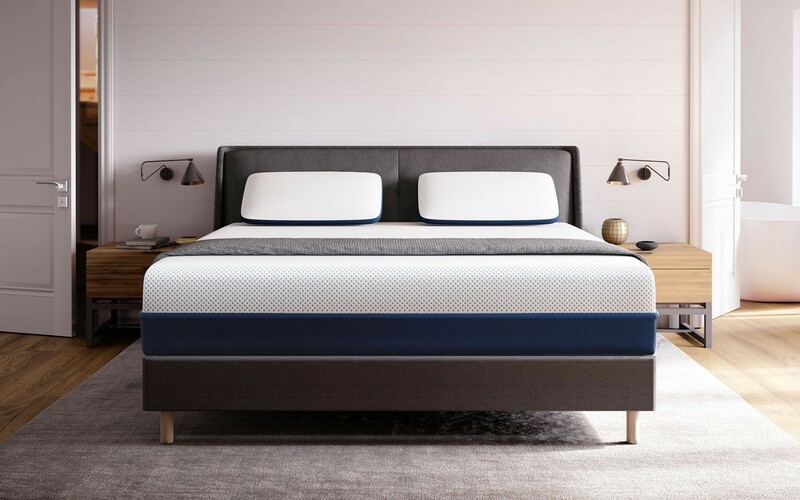 This mattress is one of five different beds offered by Amerisleep, a company that manufactures all of their beds in the United States, using plant-based foam and clinically-proven technology. When deciding on the right mattress, the materials used are perhaps the most important part to consider. An innerspring mattress supports the body differently than a memory foam mattress. A latex mattress feels different than a memory foam mattress. The quality of materials also sets apart a great memory foam mattress from an average memory foam mattress. Amerisleep uses excellent, comfort-enhancing materials in their products. Below is a detailed look at why Amerisleep is our top choice and what the Amerisleep AS3 model offers. Celliant® is FDA determined1 to promote more restful sleep, increase energy, and optimize comfort. Celliant® fabric turns our natural body heat into infrared energy, increasing local blood flow. Amerisleep puts Celliant® directly into the cover of its mattress. This is the top layer of the Amerisleep AS3. Bio-Pur® is a plant-based memory foam with advanced open-cell structure. This open-cell structure increases air space between foam particles. Because of this, Amerisleep beds are more breathable than traditional memory foam mattresses. One of the biggest complaints about memory foam mattresses is their likelihood to sleep hot. A breathable bed means a cooler night’s sleep. Traditionally, the dense foam layers trapped heat and caused sleepers to overheat throughout the night. With its advanced technology, the Bio-Pur® layer ensures this doesn’t happen. Because the Bio-Pur® layer is less dense than traditional memory foam, it is also more responsive. Responsive foam regains its original shape in a matter of seconds. So, when you move from one position to another, you are not waiting for the mattress to catch up. This is how Amerisleep helps reduce that “sinking in” feeling of memory foam mattresses. HIVE® technology optimizes the balance between support and comfort. It contains hundreds of hexagon-shaped cutouts clustered into five different zones. This helps provide comfort where wanted and support where needed. When the hexagons within the HIVE® layer are closer together, they provide more support. When the hexagons are farther apart, they offer a softer, comfort section. Plus, a clinical study found HIVE® technology can reduce pressure points up to 49%2. If you have a bed that does not allow pressure point relief and support, your body can become unaligned. This can cause pain and other health issues. If you’re experiencing lower back pain throughout the night or when you wake up, consult our post on finding the best mattress for lower back pain. The Bio-Core® layer is the foundation of the AS3 (and all other Amerisleep beds). It is the base support to all the other layers. Without the Bio-Core® layer, none of the other layers would be able to do their jobs as effectively. Also, this is where Amerisleep’s durability comes from. Because of this layer, Amerisleep can offer industry-leading warranties. They know they have a quality product, from the base up. Overall, Amerisleep’s technology and various layers set their products apart. The AS3 provides advanced comfort and the positive aspects of a memory foam mattress, without any of the traditional negative downsides. The Amerisleep AS3 and every other Amerisleep mattress are made with the highest quality materials. Their foam material is much different from most foam mattresses. Most memory foam is produced from 100% crude oil. But, Amerisleep substitutes some of that with plant-based oil, which is much more sustainable. Their manufacturing process is different from most memory foam bed producers, as well. Amerisleep uses the Variable Pressure Foaming (VPF) process to create all of their foam. As opposed to other types of processes, the VPF process produces virtually no emissions. They do this by trapping pollutants in a carbon filter during the foam creation. The VPF method is the only foam making method to exceed the Federal Clean Air Act’s standards. Additionally, VPF requires a controlled and sealed environment. So, less raw material is lost through the process. Meaning, this helps the environment and cuts down on costs. 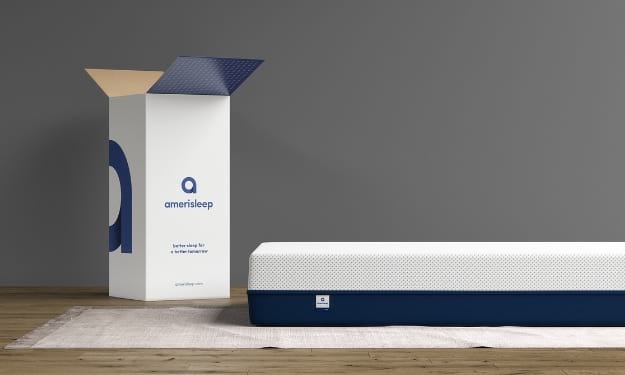 Amerisleep ships their mattresses in a way that allows them to fit three times more mattresses into the shipping space than average bed companies. Not only does this reduce transportation emissions, but it also reduces cost. Again, this means you are getting your mattress at a better price. In addition, Amerisleep uses completely recyclable cardboard packaging for all of their beds. Amerisleep also responsibly recycles their mattresses when a customer returns an Amerisleep mattress within the free-trial timeframe. Amerisleep partners with local businesses to make sure their mattresses are recycled, not thrown away. This is a huge selling point for Amerisleep. Reports show that up to 50,000 mattresses get thrown away every day, Amerisleep makes sure they are not adding to this ecological disaster. The Amerisleep 20-year warranty is one of the longest warranties in the bedding industry. For the first ten years, Amerisleep will replace any defected mattress at zero cost to their customer. A mattress is considered defective if it develops a visible sag, or impression, of 3/4 an inch or more. For the second ten years, Amerisleep gives you have your dollar value towards a new mattress, minus any shipping costs. As we mentioned above, sleep trials are a great feature of online mattress companies. Amerisleep mattresses come with a 100-Night Sleep Trial. If you are not completely satisfied, you get a 100% refund. Not only do you get a refund, but they pick up the mattress from you, with no cost to you. Additionally, once they take the mattress back, Amerisleep recycles it locally. It is a big risk to take your chances with a company that is known for poor customer service. The ideal situation is that you get your mattress and never have to bring anything up to the company that produced it. However, it does happen and, when it does, you want a company that will back their product. Amerisleep is known for incredible customer service. This is a big reason why we chose the Amerisleep AS3 as our top online mattress. We have already covered Amerisleep warranties and free trial period. This is a big part of customer service. The other side of it is how consistently they follow through with their promises. For this, we can look at company reviews. Amerisleep has an average of 4.7 on a 5 point scale. This is considering over 14,000 different verified reviews. Additionally, 98% of Amerisleep customers have indicated they would recommend an Amerisleep mattress to a friend. These are overwhelmingly positive numbers, and they speak highly of both Amerisleep’s product and their customer service. The Amerisleep AS3, individually, is rated a 4.7 out of 5 on Amerisleep’s company website. This is the cumulative score of over 5,500 reviews on their website. We should also probably note that 98% of these respondents would also recommend the Amerisleep AS3 to a friend. These numbers are a great indicator of the consistency of their product. Even Allure agrees with our decision. They have also named the Amerisleep AS3 as the best mattress you can buy online. We spent most of this post talking about the Amerisleep AS3, but we didn’t share with you how it got its name. It’s called the AS3 because Amerisleep makes five mattresses— the AS1, AS2, AS3, AS4, and AS5. Amerisleep doesn’t operate on a “good, better, and best” business model. Instead, they make five mattresses which are designed with types of sleepers in mind. The AS1 and AS2 are made for those who sleep on their stomach and back (Business Insider picked the AS2 as the best mattress for back pain). The AS3 is made for combo sleepers (those are on their back, then their stomach, then side). The AS4 and AS5 is for back and side sleepers, or for customers who want more bounce from their mattress. These are our opinions, and we hope they have helped you better understand what you want from your next mattress. We highly suggest giving online mattress shopping a try. And we especially suggest you begin your search with an Amerisleep mattress. The AS3 is a solid middle choice, although there are four other mattresses from which you may choose. If you have more questions about other types of mattresses or the bedding industry, check out our other articles. We have an article about the best memory foam mattress and one about finding the best mattress of 2019, plus an article on 8 cold weather tips for better sleep. Looking for the sealy posturpedic model 511318 mattress that I slept on at a hotel. can you find this one for me.